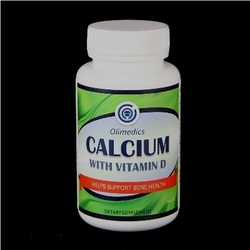 ​This product provides essential support for bone and other important systems and to prevent calcium and vitamin D deficiency. Take 1 tablet orally 1 to 4 times daily preferably with a meal or as directed by a healthcare professional. Active ingredients: Calcium, vitamin D-3. Other ingredients: Microcrystalline cellulose, vegetable stearic acid, croscarmellose sodium, vegetable magnesium stearate, silicon dioxide and aqueous clear film coat.